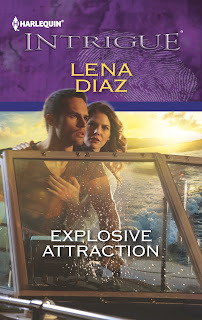 Just Romantic Suspense: What is the Witness Protection Program Anyway? What is the Witness Protection Program Anyway? Congratulations to "Tammy Y", the winner in Lena's Giveaway. Thank you to all who participated! My first Harlequin Intrigue book, THE MARSHAL’S WITNESS, is about a woman in the Witness Protection Program who has to go on the run with her U.S. Marshal protector when someone leaks her new identity. The first thing I discovered while researching this story is that there is no such thing as the ‘Witness Protection Program’. The official name is the ‘Witness Security Program’, or WitSec. But most readers have only heard of Witness Protection, probably because of movies. So how could I be true to the facts, but not make readers who only know the movie version come along for the ride and trust my research? My solution was to show a conversation between the hero and heroine where he uses the correct name and she uses the one most readers are familiar with. I juxtapose fact and myth, maintaining my credibility as an author, showing I did my homework! The second thing I discovered about WitSec is that there really is precious little written information about this program, by design. The Justice Department has done an incredible job keeping the details secret, which perhaps explains why no one in WitSec has ever been killed by the enemies they testified against. It’s only when WitSec witnesses leave the program that they have been killed.That’s a truly amazing fact and speaks to the intelligence and abilities of the people behind this program. Why would anyone leave WitSec? Or better yet, why would they even go into WitSec in the first place when they have to leave behind everything and everyone familiar in their lives, never to see them again? Those types of questions were what I wanted to know when I was researching this story. The best resource I found is a book written by journalist Pete Earley, with input from the founder of the program, Gerald Shur. The book is called WitSec: Inside the Federal Witness Protection Program. It’s a hefty 450 pages chalk full of emotional details from actual witnesses in the program. Reading this book didn’t give me a whole lot of WitSec facts - because most of those facts are still secret - but it gave me enough to run with the story and put my own twist on it. But more than that, it gave me a glimpse into the emotional turmoil these people and their families go through when confronted with the prospect of testifying against someone and then having to go into hiding for the rest of their lives. One juror. That's all it had taken to set a murderer free. Jessica Delaney flattened her hands against the conference-room window of the White Plains Federal courthouse, watching the mockery playing out two stories below. Mistrial. The word left a bitter taste in her mouth. What would that juror have done if his friend had been brutally murdered in front of him? Or if his life had become the nightmare Jessica's had become, living in fear that her former boss would discover where the government was keeping her during the year-long trial? She'd been foolish to think her testimony could make a difference, that a twenty-eight year-old accountant could put the head of the most powerful crime family in New York away, when others had tried and failed before her. She'd given up everything—her home, her friends, her job—to become the government's star witness. For what? DeGaullo was free, and she was about to go into hiding. Her hands tightened into fists as Richard DeGaullo waded through the crowd of reporters, smiling and waving like a foreign dignitary instead of a man who'd viciously executed a young mother, leaving two small children behind to mourn her death. He jogged down the steps, his perfectly pressed suit jacket flapping in the wind as the first fat raindrops from an afternoon storm splattered against Jessica's window. Freedom waited for DeGaullo in the form of a black stretch limo snugged up against the curb. The driver opened the rear door. Jessica sucked in her breath when DeGaullo turned and looked up, as if he knew she was watching. He raised his hand in a jaunty salute, flashed a cocky grin, then slid inside the car. A loud knock sounded behind Jessica, making her start in surprise. She turned around to see a man she didn't know, standing in the open doorway. The briefcase he held looked like a child's toy in his large hand, and the top of his head barely cleared the door frame. I hope you’ll give THE MARSHAL’S WITNESS a try. I’m going to give one free copy to a commenter on this blog post. Just tell me your opinion of WitSec. Do you think it’s a good program, because the witnesses put some of the worst criminals out there behind bars? Or do you think the program is flawed, because most of the witnesses in the program are criminals themselves who are being given a clean slate, a new life, in exchange for their testimony? The Witness Protection Program hasn't lost anyone who is in the program and that is impressive. There are criminals who want to get out but are unable to. As in anything, the justice system has to chose the lesser of the two evils. Do they put the worst criminal in the witness protection program to save several life or do they prosecute the worst criminal where the lives are lost around the circumstances? That is a difficult question to answer. But again, the pros have to outweigh the cons. Kai, those are really good questions. And as you said, very difficult ones. I'm sure if I was the one hurt by the criminal who ended up as a protected witness, I'd be devastated. But at the same time, I can see the benefits of getting the 'worst' bad guy behind bars. Thanks for stopping by. Most of what I know about WitSec is from the TV show In Plain Sight. I guess I don't know enough about the program to form an opinion. Jane, I haven't seen that program. I don't get to watch a lot of TV because I write so much. But maybe I'll check it out. Thanks. This sounds great! Just read the longer excerpt on Amazon and smiled at the 'pen' exchange! Lol! And just bought it! Sold! Awesome! Thanks Willa. I really hope you enjoy it. My books tend to be serious but I love injecting sarcasm and dark humor here and there. Glad you 'got' that little pen exchange. I think it must be tough for people who have been victimized when the person responsible does not get punished for it. Hi Maureen. I agree. To me that is the biggest problem with the program. But it's hard to argue with the amazing success it has had in bringing down organized crime. Thanks for stopping by. It's a great statistic that no one has been killed while in the program. And it's great that criminals are finally put behind bars because people can safely testify, but it's sad that these individuals have to give up so much in order for the criminals to be brought to justice. I believe that even good programs can have flaws - nothing is perfect. Hi Karen. I think you hit the issue right on the head - no program is perfect. They are all flawed. So I guess I'd have to say, WitSec is definitely flawed, but what's the alternative? Is there a better way? When WitSec was originally created, I'd say it was the best idea out there for the type of organized crime our country was suffering under. But I do wonder if there might be better alternatives today. Something to think about. It is a good program, We need to protect the people who testify against the worst criminals. Hi Tammy! I can definitely see that point of view. It's wonderful to have protection and a new life as reward for putting your life in danger and helping put really dangerous criminals behind bars. I'd like to mention here as well, that there are a lot of people in this program who are NOT criminals. So just because they are protected witnesses doesn't mean they were ever on the wrong side of the law. Statistically speaking, most are criminals, but certainly not all. So I don't want to paint everyone with that brush! Thanks for stopping by. Glad the program keeps people safe and puts criminals in jail... I just can not imagine being taken away from your life for an untold amount of time and becoming someone else. Thanks for sharing Lena! Hi Colleen. That's the part that tugged at my heart when I read about WitSec. It's the families of the witnesses that suffer the most. Often an entire family is put into WitSec because of one family member's choices. Imagine being a teenager and having to give up your friends, your boyfriend, change your name and move away. It would feel like the world was ending to a tender teenager. It's really sad for everyone involved. Congratulations on your new release, Lena. I have it queued up and ready to read! I want to meet the man with the "toy suitcase" ! Witness protection is a fascinating subject. Clearly, there is a need for it, especially in cases like the one in your book where a victim or innocent witness gives testimony. And if someone is given a deal in exchange for testimony, that seems similar to any reduced sentence or immunity deal. But where it gets tricky is I am wondering what happens when someone in the Witsec program commits a NEW crime. Can they be prosecuted, even if it would expose them to discovery? Carey, nice to see you here. And the answer to that question is a big yes! People in WitSec are supposed to abide by the law. They can be kicked out of the program and prosecuted if they break the law. It's not like diplomatic immunity (thank goodness). However, the problem is when a witness is in WitSec and continue to testify through the years at various trials. In that case, even if they break a new law, they may continue in the program because their value as a witness may outweigh whatever they did. It's definitely not perfect. I feel that it is a necessary program to put criminals behind bars. However, I would think that it would be very hard on the person in the program. Thanks for stopping by. I totally agree with your comments! And if you'd like to be in the drawing for a free book, please stop back by and give your email address. Take care. Thank you so much Maureen for allowing me to blog today. I'll continue to stop back by tonight and tomorrow to answer any questions. Good luck to all the commenters on winning a free copy of my new release! Short and sweet. LOL. Thanks for stopping by bn100. Very admiral sentiment, Veronica. Thanks for joining the conversation. Erin, LOL! I get the double entendre. Glad you enjoyed the post and thanks for stopping by. of those serious crimes. That is the only way that justice was served,in many cases. Very interesting book. I think that it's a very worthwhile program. No one would speak up if they did not have that protection. Thanks Mary. I agree it's a worthwhile program too. I just wonder how I'd feel if I were personally involved. It's tough, either way. Hi Kerrie! It was a fascinating book, wasn't it? I loved all the personal stories of people in the program. And I really admire the brilliant minds behind the program. I've read THE MARSHAL'S WITNESS and it's a terrific book. Loved it, Lena. And this was a great post. Thanks for sharing the background of the book. I can't imagine having to leave everyone and everything I know to trust total strangers with my safety at a scary time in my life. But, thank goodness some people are strong enough and brave enough to do the right thing to put the "bad guys" away. I'm equally thankful that there are good men and women who know the meaning of "secret" identity and help those that need it to start a new life. Look forward to reading The Marshal's Witness. Thank you for the giveaway and for being such an amazing author! LOL, Julie. I'm sure you'd do just fine with your new identity. Thanks for stopping by and adding more interesting points to this discussion. It has been such a fun conversation all around. Lots to think about. At the very least, I hope people can appreciate how difficult being a U.S. Marshal would be, at least those involved in witness protection. They put their lives on the line for people they may not respect one bit. That's amazing to me, and shows a depth of character that's truly admirable. Good luck in the drawing.